A hearty breakfast that features the familiar eggs and bacon, but in a fun preparation that also incorporates the goodness of Hass avocados. 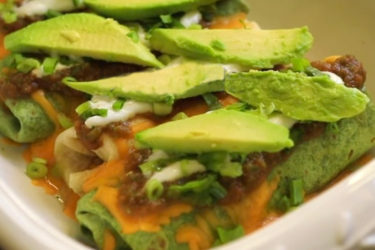 Recipe contributed to Avocado Central by Chef Sue Torres, Chef/Owner of Sueños Restaurant, NYC. Used with permission. Heat a skillet or cast-iron pan on medium-high. Coat the pan with olive oil. Add the scrambled eggs to the hot oil. Use a high heat rubber spatula to stir the eggs. Lower the flame to medium. Continue to stir the eggs for about 3-4 minutes or until cooked. Add the cheese. Remove the eggs from heat, but cover them to keep warm. Heat a new saucepan over medium-high heat and heat the tortillas, one at a time. Lay out each tortilla side by side on a clean surface. 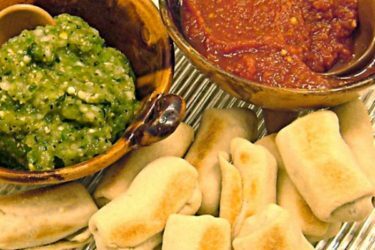 Spoon 2-4 tablespoons of avocado-buttermilk dressing onto each flour tortilla. 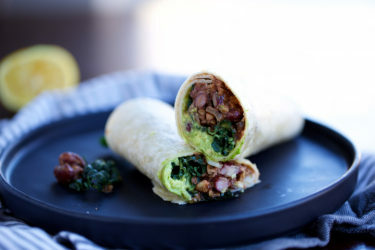 Lay two slices of bacon on the center of each tortilla. Add 1/4 cup of pico de gallo on top of each piece of bacon. 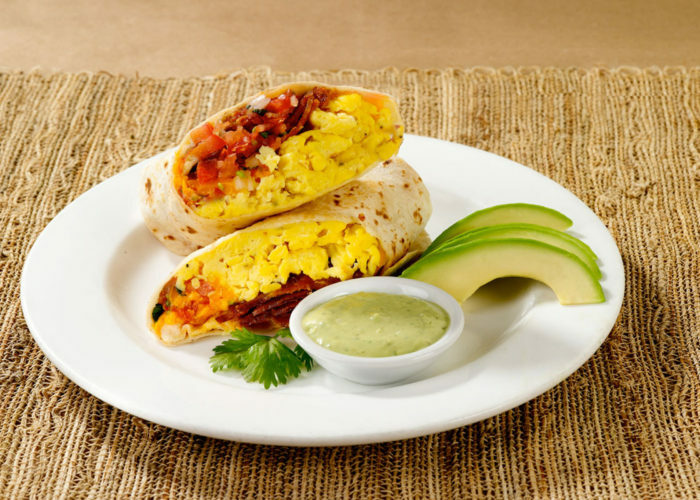 Distribute the eggs equally between all tortillas, laying on top of the bacon and pico de gallo. Fold the left and right sides of the tortilla over the fillings. Bring up the side of the tortilla that is facing you. Pull it tight and tuck it under the fillings. Roll forward to form a burrito shape and lay it face down on its "seam". The avocado dressing will act as a seal. Cut the burrito on a 45° angle bias and serve immediately. In a medium-sized bowl, combine all of the pico de gallo ingredients. Refrigerate and allow flavors to blend. Add all of the dressing ingredients in a blender and purée until smooth. Season the dressing with salt to taste and set aside.